Kerala is located in South India on the Malabar Coast. It was formed on 1 November 1956. Thiruvananthapuram is the largest and capital city of this state. Kerala has the highest literacy rate (93.91%) in India, as per the census 2011. In terms of education, this state has some top colleges of India like NIT, & state government engineering colleges etc. From these colleges candidates can pursue engineering courses in a variety of specializations. 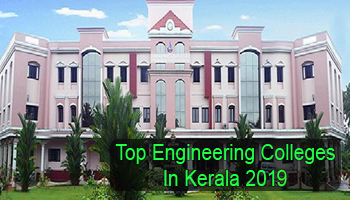 Here we have provided a list of Top Engineering Colleges in Kerala 2019 including admission procedure. Sarvgyan.com is providing a list of top engineering colleges in Kerala for the year 2019. Top government & private colleges and universities like National Institute of Technology (NIT) & others have been included in this list. The colleges have been rated on the basis of several factors which are important in terms of quality education. These factors are national importance, placement records, quality of education, affiliation and approval status, student’s preferences, college infrastructure, facilities & faculty ratio. Students have to qualify KEAM (state level examination) or JEE Main (national level exam) to get admission in B.Tech courses. The Commissioner of Entrance Examination (CEE), Kerala organizes KEAM exam for providing admission in engineering courses. Some universities conduct their separate entrance tests like CUSAT & AEEE (Amrita Engineering Entrance Examination) for admission in B.Tech courses. Candidates can appear in the GATE exam for admission in M.Tech course. There are various specializations offered by different engineering colleges in Tamil Nadu. Students can choose the specializations as per their interest. Some top specializations are Mechanical Engineering, Aerospace Engineering, Civil Engineering, Computer Science & Engineering, Chemical Engineering, Electronics & Communication Engineering, Electrical & Electronics Engineering, etc. If you have any other queries about Top Engineering Colleges in Kerala 2019, you may leave your queries below. is Saint Gits college best or not??? I have +2 84.25% mark. If contacted JEE exam, (JEE RANK above 7lakh.) I can apply in management quota in kerala state engineering colleage. Whether christ engg college Irinjalakuda is best or not? My JEE rank is 57488.